This office represents the Save Craryville organization which has serious concerns about the GRJH gas station proposal. We have previously submitted comments relating to the compliance of the proposed facility with applicable law and its inappropriate scale regarding the other buildings in the hamlet. We write to comment on the latest site plan submitted by the applicant. As we have previously commented, the changes in the proposal since the original site plan have reduced its impact and the instances of noncompliance with the zoning code. However, several areas identified in Save Craryville’s previous comments. remain to be addressed. These include, among others, the size of the convenience store, the intensity of the lighting, the lack of vegetative screening from neighboring properties, and the compliance of the sign (including the framing) with the maximum area in the code. All of these are discussed in more detail in the January 3, 2019 letter to you from our office, which we incorporate by reference. The size of the convenience store remains substantially out of conformity with the scale of the surrounding hamlet. At 3,240 square feet, the store would remain by far the largest building in the neighborhood. In contrast, the post office and the church are approximately 1,600 sf. and 1,400 sf., respectively. The continued oversizing of the store is particularly problematic since the applicant has withdrawn the proposed use as a restaurant, which occupied about 1⁄2 of the original store area. In the latest plans, there remains space for a kitchen which is unnecessary since there is no longer a restaurant use. Removing the kitchen and reducing the restaurant area which is no longer necessary would enable the store to be more consistent with its central location in Craryville. In this regard we continue to urge the board to require the applicant to submit a visual impact report pursuant to section 232-21H(3)(c) of the town code. Absent such a study the board should not approve a convenience store twice the size of the largest historic buildings in the hamlet. Save Craryville has retained an environmental engineer, Bart Clark. P.E. of Oakwood Environmental Associates, to review the site plans, and his comments are submitted herewith. 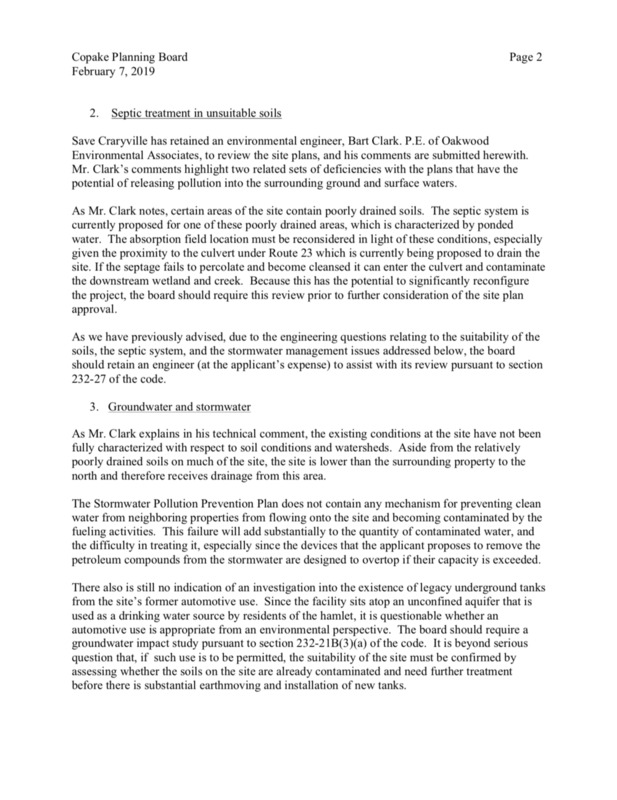 Mr. Clark’s comments highlight two related sets of deficiencies with the plans that have the potential of releasing pollution into the surrounding ground and surface waters. As Mr. Clark notes, certain areas of the site contain poorly drained soils. The septic system is currently proposed for one of these poorly drained areas, which is characterized by ponded water. The absorption field location must be reconsidered in light of these conditions, especially given the proximity to the culvert under Route 23 which is currently being proposed to drain the site. If the septage fails to percolate and become cleansed it can enter the culvert and contaminate the downstream wetland and creek. Because this has the potential to significantly reconfigure the project, the board should require this review prior to further consideration of the site plan approval. As we have previously advised, due to the engineering questions relating to the suitability of the soils, the septic system, and the stormwater management issues addressed below, the board should retain an engineer (at the applicant’s expense) to assist with its review pursuant to section 232-27 of the code. As Mr. Clark explains in his technical comment, the existing conditions at the site have not been fully characterized with respect to soil conditions and watersheds. Aside from the relatively poorly drained soils on much of the site, the site is lower than the surrounding property to the north and therefore receives drainage from this area. The Stormwater Pollution Prevention Plan does not contain any mechanism for preventing clean water from neighboring properties from flowing onto the site and becoming contaminated by the fueling activities. This failure will add substantially to the quantity of contaminated water, and the difficulty in treating it, especially since the devices that the applicant proposes to remove the petroleum compounds from the stormwater are designed to overtop if their capacity is exceeded. There also is still no indication of an investigation into the existence of legacy underground tanks from the site’s former automotive use. Since the facility sits atop an unconfined aquifer that is used as a drinking water source by residents of the hamlet, it is questionable whether an automotive use is appropriate from an environmental perspective. The board should require a groundwater impact study pursuant to section 232-21B(3)(a) of the code. It is beyond serious question that, if such use is to be permitted, the suitability of the site must be confirmed by assessing whether the soils on the site are already contaminated and need further treatment before there is substantial earthmoving and installation of new tanks. Clearly, the combined remaining questions regarding the prior use of the site, the problems of septic siting in wet and flooded soils and the incomplete planning for stormwater treatment, all over an unconfined aquifer, require further review by the board.